Sports can be an ideal ally of social good. The combination of a unique athletic challenge and an innovative approach to solving social problems resonates with the general public and with influential athletes. We are firm believers in the power of sports to inspire people to do good. 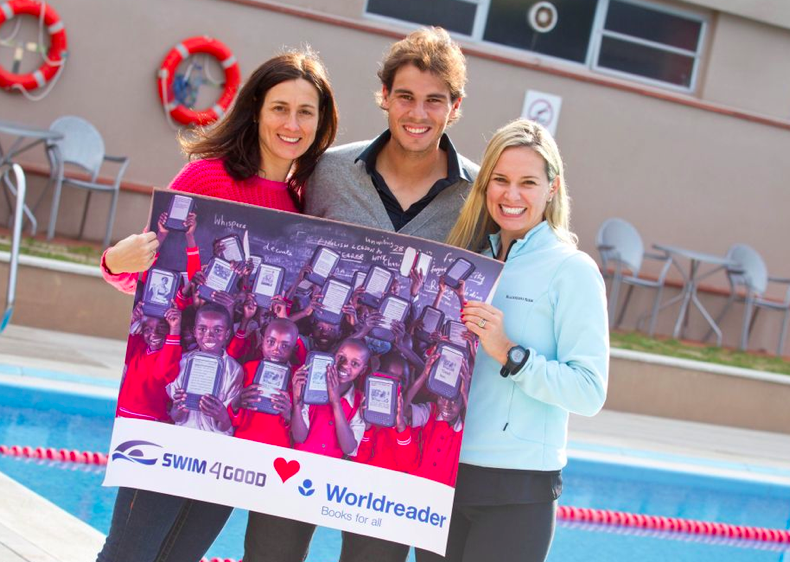 Swim4Good was launched on August 2012 by Emily Kunze, Susan Moody and Mauricio Prieto with the objective of swimming across the Strait of Gibraltar and raising $100.000 for Worldreader, a non-profit organization that uses mobile technology to give access to books to kids in developing countries that had never had access to books. On July 11 2013 Emily, Susan and Mauricio successfully swam across the Strait having raised $109,861 for Worldreader and having gotten significant media attention and support from the likes of Rafa Nadal, Pep Guardiola, Kery-Anne Payne, Mireia Belmonte, Damian Blaum, Luis Enrique and other top athletes. Swim4Good’s Gibraltar swim was voted runner up in the World Open Water Swimming Association’s 2013 Performance of the Year award. Swim4Good’s next big swim was an attempt to cross the Sea of Cortez in 2013, in collaboration with Night Train Swimmers– something which has been tried before without success. The team made it half way before the weather made it impossible to continue. Swim4Good has grown into a group of Open Water swimmers who take on various swimming challenges: including the English Channel in 2014 and the length of Spain’s Costa Brava in 2015. The Costa Brava swim was the longest 6-person relay in continental Europe (118 kms in 32 hours). In August of 2014, co-founder Susan Moody was diagnosed with breast cancer and underwent an intense 11 months of therapy before becoming cancer-free. She wrote about it as if it was like crossing a difficult body of water. Today, Swim4Good is actively raising money to support cancer research. 1. Competitive. Swim4Good participating in at least 2 relevant swims per year, ideally with a fundraising objective. 2. Recreational / social. Swimming meet-ups to discover new places, meet other swimmers and further enhance our open water swimming experience. Some of these informal and recreational swims have a fundraising component as well. We are proud to have a community of committed and passionate open water swimmers both professional and amateur. See the list of Swim4Good Swimmers. Thanks Mike. Glad that you like it! Mucha suerte Richard con el IronMan, y ojalá nos veamos pronto por aquí. Muchos saludos! Muchas gracias Sonia. Seguro que lograrás tu reto de los 3km. Ya nos contarás como vas progresando. Muchos saludos!